Greetings, it’s Andy Gesner and the staff from HIP Video Promo, here to spread the word about the latest clip from one of the world’s best-loved pop bands. The poet Paul Éluard is remembered as one of the founders of the surrealist movement; “Éluardian” is best understood as a synonym for strange, brain-expanding, “far out”. No wonder, then, that Kevin Barnes is drawn to Éluard. 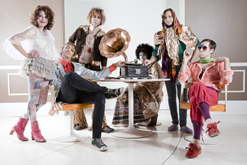 Over the past decade, of Montreal has been about as surrealistic and hallucinatory as any pop group we can remember – touring its mind-blowing show across the globe, and releasing albums that are complex and beguiling, yet immediately accessible. of Montreal gigs have become events: devoted fans, dressed in outrageous costumes and make-up, travel for miles to be part of the dreamscape. Rolling Stone magazine recently profiled the movement in a multi-page article that named Barnes “rock’s newest damaged genius”. Recognition often encourages conservatism: artists sometimes respond to acclaim and enthusiasm by repeating the moves that made them successful in the first place. Not Barnes. The more popular he becomes, the more willing he is to take chances. Skeletal Lamping, the latest full-length from of Montreal, is the most adventurous set the group has ever released – and that’s saying something. Barnes crams as many musical and lyrical ideas into single songs as most artists do on entire albums, and whips listeners from hook to dazzling hook at breakneck speed. It’s a musical joyride, colorful, marvelously performed, and frequently hilarious, and there’s nothing out there that’s even remotely like it. “An Éluardian Instance”, the latest single, is a perfect introduction to the restless brilliance of Skeletal Lamping. The song consists of at least four distinct musical sections, each of which complements and colors the others. The pastiche begins with a fanfare of soul horns over skittering drum machine; this is punctuated by a cascade of synthesizer that feeds into a gorgeous pop reverie about “our last summer as independents”. And just before the song ends, of Montreal turns the beat around completely, sliding into a slinky psychedelic bass groove. In between, Barnes tickles the listeners with his customary tinsel strands of melody, aerial harmonies, paper-plane guitar and treated piano. Jesse Ewles (Final Fantasy, Grizzly Bear) has an Éluardian soul, too – he knows how to tease the essential weirdness out of everyday activities. His clip for “An Éluardian Instance” is bizarre and wonderful, and, like all of his videos, rewards repeated viewing and close engagement. It’s also, perhaps, the finest use of kites and origami we’ve ever seen in a pop clip. The most spectacular kite hangs in the sky like a gigantic multi-colored cloud. This apparatus may (or may not) be held in place by a pair of fetching young women who are enjoying the day atop a seaside cliff. One is serious – she pushes away the director’s camera, and buries her nose in Éluard’s “Capital Of Pain”. Her playful and bespectacled friend is more animated; she smokes, combs the beach, folds paper, chats, collects mussels and eats them raw. Ewles’s stop-action filmmaking makes every action appear remote and trippy – yet the personalities of these characters are vivid. When the song changes tone, a jet plane crashes through the canopy of kites, and origami covers everything on the beach like a rain of cherry blossoms. As always, we’re delighted to have opportunity to work with the good folks at Polyvinyl Records to bring you our seventh(!) of Montreal video! If you need more info, call Andy Gesner at 732-613-1779 or e-mail us at info@HIPVideoPromo.com . You can also visit www.PolyvinylRecords.com or www.ofMontreal.net to find out more about of Montreal.